Stainless steel with big handles and fine point, so good for precision cuts. A good economical scissors. A really good value for the price. Made in Pakistan. Personal note - Amazing for the price... I have these scissors all around my working areas. Sharp pointed titanium straight edge scissors. 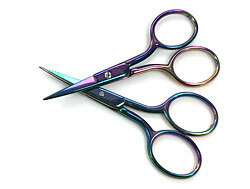 The rainbow coating makes these scissors easy to identify. Great value for the price. Made in China. Personal note - If you dedicate scissors for specific tasks, such as cutting nylon and silk thread with different scissors, the rainbow coating makes these scissors easy to identify. I am dedicating one pair of these to silk. Economical scissors with rounded ends, the classic stork design, and golden handles. A good value and nice design for the price. Made in Pakistan. Stainless Steel. Good for all around use. Made in Pakistan. Stainless Steel # 5 tweezers - 4 inch 5/8 long (11.8 cm). Comfortable width and nice point perfect for sliding knots when stringing beads. Personal note - These are pretty good for a fraction of the price of a pair of Dumont tweezers from Switzerland. New by Eurotool. 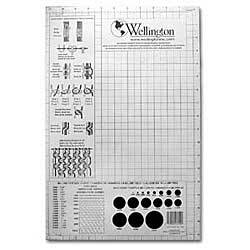 Perfect for enlarging bead holes and smoothing bead edges. Includes 3 diamond tips (2 tapered tips - one short, one long and 1 45º edge tip). Variable Speed Control 1,000 - 18,000 rpm. Use water or a lubricant when cutting with diamond instruments and let the diamond tip do the cutting, do not force the tip in. Personal note - The adjustable speed right in the handle is nice. I had to work adjusting the tips after changing them to keep them well centered so they would not wobble. Once adjusted, this tool work very well. So now I keep my older set and the newer one, one with a tapered tip, the other with the edger. 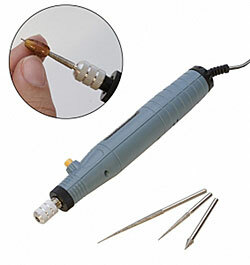 New bead tweezer designed specifically for sorting and handling beads and delicate pearls. This tweezer tip is nylon so it will not scratch or damage beads. The shank is made of high-grade stainless steel for a light touch with excellent grip. Personal note - Good for holding round beads while reaming them! This set includes three diamond tips, a small and a large reamers plus a 45º edge. The tips get stored in the handle. The handle has a comfortable cover. Engineered by Euro Tool. Made in the U.S.A. Personal note - A must if working with gemstone beads! Includes: One large (left), one fine (middle) diamond reamers, plus one 45º edge (right) for cleaning bead edges. By Euro Tool. Made in the U.S.A. Personal note - Better quality than the last sets I carried, plus made in the USA! 1 small fine tipped diamond reamer by Euro Tool. Made in the U.S.A. Best reamer to enlarge bead holes. Personal note - I am very happy to have found this tip all by temselves. These are for fine hole beads! 1 large fine tipped diamond reamer by Euro Tool. Made in the U.S.A. Best reamer to enlarge bead holes. 3 units shown in picture. Personal note - I am very happy to have found this tip all by itself as I use it faster than the other tips! A two-piece set with wooden handle. The very fine has a reamer with tiny file-like edges of 0.6mm (.02") diameter, the fine a 1.0mm (.04"). Delicate fine tools for delicate materials. Made in the U.S.A. 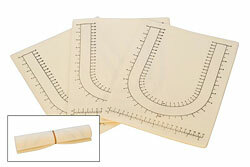 Personal note - Great for enlarging the holes of pearls by twisting or for probing fine holes! 6" long with a very fine stainless steel point, nice weight and a comfortable foam dipped handle, currently blue. Made in Pakistan. 4 1/4" long with a very fine stainless steel point, nice weight and a comfortable foam handle currently pink. Made in Pakistan. Personal note - Either one is good for taking knots apart or probing beads! Personal note - Using a wood block, insert point right into the seed beads that needs to be broken. Very useful for kumihimo and tubular bead crochet ropes. 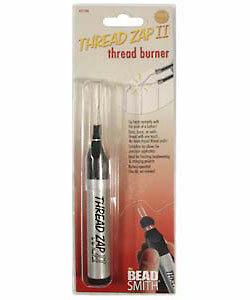 Thread burners, zappers and sealers are a great tool to have when working with thread and cord. 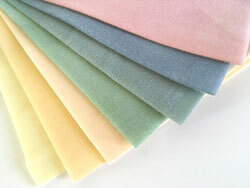 They can be used on synthetic cord & thread, such as nylon, and silk. 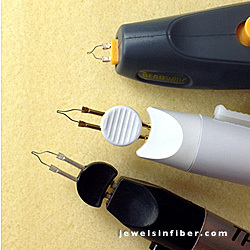 When used to cut, they cauterize the ends and keep them from unravelling. When used to melt and to fuse the ends they prevent the final knots from getting untied. It is best to let the cord melt and to push the melted end against the knot rather than melting the knot itself. These tools are so much more precise than a cigarette lighter. They are a necessity for making Shambhala bracelets with Chinese Knotting Cord and for sliding square knot closures. The Cord Zap & Super Max Burner gets red hot immediately. The other burners do not get as hot and take longer to reach their highest temperatures. 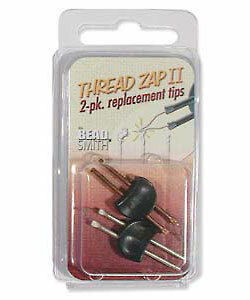 The Ultra Thread Zap gets hotter faster than the Thread Zap II, but a smaller area of the tip gets red. 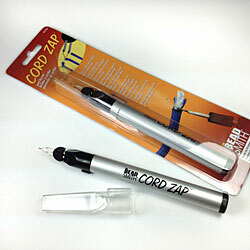 Best Features - Cord Zap & Super Max for red hot tip. 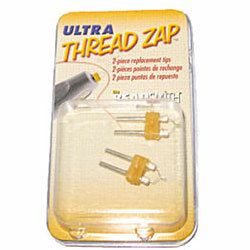 Ultra Zap for retractable tip. Zap II for best price. For safety, remove the battery or the tip when storing. Keep away from children. These tools work well when finishing a limited number of thread as each individual thread or cord needs to melted one at a time. May leave discoloration especially with light colored thread or cord. 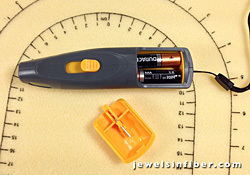 Change the batteries often and let the tip cut or melt without forcing to keep the tip from getting damaged. And foremost be careful not to melt or burn your work! Designed originally for working with wax models. Battery operated with 2 AA battery included. 9 " (22.5 cm) long. 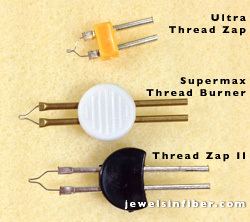 Burns hotter and gets to a higher temperature faster than any of the other thread burners. Best for heavier cords and for designers like myself always in a hurry! Just like light bulbs, the tip needs replacement occasionally. Always check the battery first unless you notice obvious damage to the tip. Battery operated with one AA battery (not included). 6 inch (15 cm) long. Takes the longest time to get hot. Best price. Some the tips of the models tested just fell out when the burner was opened as there was not enough friction between the tip and the fittings into the tool handle. Here is the fix for this problem: widen the space between the two prongs for a proper fit. Battery operated with two AA battery (not included). 8 inch (20 cm) long. New burner. Gets hottest the fastest. Good price. This is the newest burner on the block as of March 2016. Gets red-hot the fastest and to a hotter than all the other thread burners. But be cautious though, it gets too hot for thin thread. This one is for heavier cords, not thread. I am growing very fond of this tool for heavier cords! Just like light bulbs, the tip needs replacement occasionally. Always check the battery first unless you notice obvious damage to the tip. Includes two tips. Battery operated with two AAA battery (not included). Include 1 extra tip in battery compartment. 5 inch (12.5 cm) long. 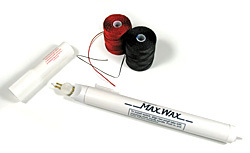 Best for working with fine thread, such as C-Lon Bead thread Size D, AA and Micro Cord and in area when you do not want the red hot tip of the Super Max Burner. Personal note - I work with a board attached to an artist easel. It is easier on my back. For several years, I have used a Lacis board with a bead mat attached on top for comfort. So far it's holding amazingly well. I have not had to replace it. In workshops, some of my students have a clear preference of one brand over the other, and some use the two boards combined with the Lacis one pinned to the traditional board for the extra weight. Another great option is the Mini-Board attached to the cardboard center of fabric bolts. Comparing the Lacis and the Beadsmith Boards: At the last Cavandoli workshop, we found that the Beadsmith boards hold the T-pins very tightly. To save fingers from extra strain, use a pair of pliers to pull them off. For Cavandoli, the Lacis board might be best, but for anything where you want an extra hold, such as square knotting, Shambhala bracelets, leather wrap bracelet, the extra hold of the Beadsmith board might be best. Alternatives - Several sheets of foam board glued together for a finished thickness of at least half an inch, cork bulletin boards, velveteen jewelry tray inserts, but watch out for pins sticking out of the back of boards or stiff pillows attached to boards! Shipping note - Shipping weight is about 1.5lbs/680gr. Shipped International by USPS First Class Mail in a padded envelope with a cardboard liner. Extra charge may apply. 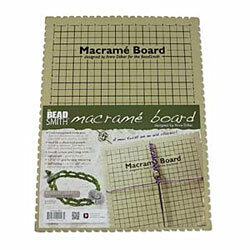 Personal note - This is the traditional macrame board. Its weight makes in a good board to hold at a 45º angle off a table edge. To extend its life, recover the board with clear plastic tape when damaged. Will shed and self destruct with heavy use. 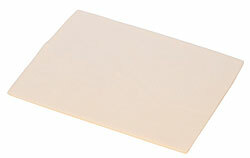 A white 12" x 16" x 1/2" oval polyurethane closed cell board with grip slots along one edge for holding the free thread ends in tension or out of the way. Shipping note - Shipping weight is about 1lbs/375gr. Shipped Internationally by USPS First Class Mail in a padded envelope. Personal note - I would add a fabric cover with an open end for access to the slots as I don't like the feel of the polyurethane. This board is light and does not shed like the particle board listed above. Best used flat or attached to something else. Same as above, but comes with a soft bead mat and complimentary T-Pins. T-pins hold the bead mat place and use them to secure work in place. 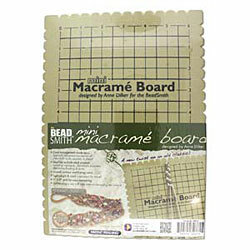 This board can be used for macrame as well as leather wrap bracelet as shown in this picture. The extra materials shown with the board are not included. Personal note - Great to work on leather wrap bracelet. I set it up for a demo of the leather wrap bracelet and found it to work so well, I now use it in my studio, flat on my table. The slots at the bottom of the board hold the leather in place. Empty bead tubes elevate the leather off the board for easy access to add the beads. Personal note - It's a good board. It can be leaned against a table or placed flat on a table depending on what you making. The side slots are good the anchor cords. The only draw back is the smell of the board once you remove the plastic. I left mine outside to air out for a few days and the smell dissipated. Same as above but smaller. 7.5 inches by 10.5 inches with a 6 inches by 9 inches grid for measuring. Personal note - Perfect size for doing leather wrap bracelet, very portable. To hold the mini boards against a table the best option is to pin it to the cardboard center of fabric bolt. Ask for one at a fabric store or quilting supplier. 9 inches by 12 inches. Light Brown in color. A bit darker than he color shown and above pinned to the Lacis Board. Personal Note - I also like to pin one on my knotting board as it makes a softer surface to knot against. 11 inches by 14 inches. Choose from colors available. Personal Note - I order in assorted colors as it is nice to have a color choice. Imprinted with inches and centimeters. 9 1/2 inches by 12 1/4 inches (24 cm x 31 cm). Can be rolled with project inside and secured with two elastic bands, one on each side is more secure than one as shown in picture. Comes in package of 3 or singly. 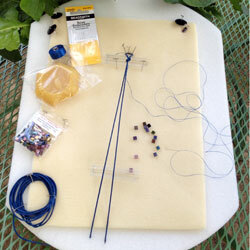 Personal note - I often include this bead mat with my student kits when teaching. It beats paper plates to keep our beads from rolling around plus it has a ruler easy to reach. Comes with instructions for cord making. Current corder is all black with metal fittings. Personal note - I have used this small portable hand tool for many years to make 2 and 3 ply cords. I really like it for plying silk. It fits easily in my small portable tool pouch. I have made cords with this tool at demos, in hotel rooms! Use with a reversible cordless drill. 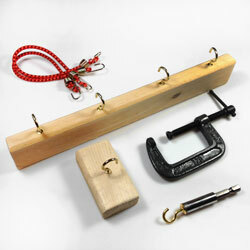 Includes 1 drill attachement with a hook, 1 wood bar with a hook with a 2 inch C-clamp, 1 wood bar with 4 hooks, 2 mini-bungie cords, 4 regular and 4 jumbo paperclips, plus access to the PDF Manual + 3 Projects described below. Personal note - This is the set up I use in my studio. 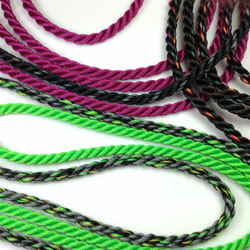 It works well for making twisted cords with C-Lon Bead Cord and bonded nylon. This instructions for this tool kit have just been updated and now include 3 additional projects! Downloadable PDF Manual - Just Updated! This is a step by steps instruction for making 2-ply, 3-ply and 4-ply twisted cords. It includes cord making terms, a comparison of available cord making tools, how to make your own set of tools, tips for cord making, measurements, colors and nylon brands, plus a chart of cord diameters made with C-Lon Bead Cord. Metal swift with flexible covered ribs. Extend for skeins up to a 60 inches. Can be position horizontally, vertically or diagonally. Adjustable table clamp. 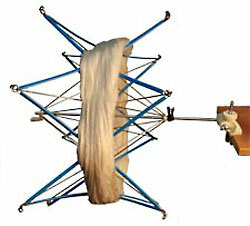 Small attached handle allow the swift to be used as a skein winder. 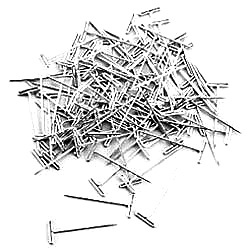 Package of 10 grams of 1 1/4 " Steel T-pins, packed by weight, usually contains about 60 T-pins. The thin diameter is perfect for micro macrame. Personal note - I use these T-pins for pinning my work to the board for my micro macrame work. I found the steel T-pins to be the only one that do not bend with repetitive use. This size is not always available in local stores and is the perfect size for working with C-Lon and Nylon #18. 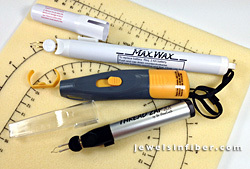 The T-pins usually sold in stores for micro macrame are the 1 1/2" ones and their diameters are too large for fine work! Package of 10 grams of 1 3/4" Steel T-pins, has about 18 pins. Personal note - I use these T-pins for pinning cords, large elements such as gemstone donuts or to keep large groups of thread out of my working area. Either size works as the diameter is the same. Packages of 4 needles each. Personal note - Long, thin needles, usually used for beading small diameter beads with thin thread such as C-Lon Bead Thread Size D & AA! Package of 6 assorted needles. Easy to thread, work from either end. Personal note - No need of a threader! 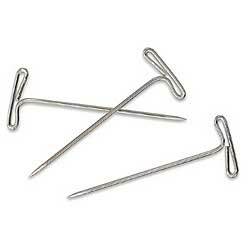 These needles are made out of twisted stainless steel wire, making them strong, yet flexible. They are a good choice for working with pearls, gemstones beads or beads that are somewhat irregular or have curved holes. Made in Germany. Packs of 25 needles. Personal note - Match the size to your thread... One pack will last a long time! Package of 4 needles. Blunt ends. 2 size 10, 2 size 12. 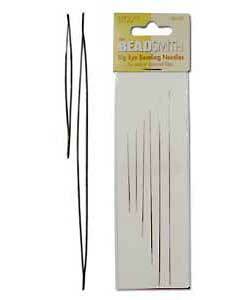 Designed for bead embroidery, so shorter than the standard English bead needles. Works well with C-Lon Bead thread size D and AA. Personal note - I prefer blunt ends over the regular English needles. The blunt ends lowers the likelihood of splitting the thread when going through the beads multiple times!